I recently came across a book that is very meaningful to me for a couple of reasons. First, Jerry Bundren has been a friend for many years. We went to high school together and he actually tutored me in my math classes. I was Best Man in his wedding. Jerry went to college and then into the Navy. Thankfully, we’ve been able to stay connected. Secondly, family is very important to both of us. We each have 2 sons and doing anything we can to help them develop into godly young men takes high priority in our lives. Jerry wanted to impart some wisdom to his sons, to share some life lessons, biblical principles and spiritual truths he had gleaned to help them in life. He began to write letters and as he did, he realized those letters weren’t just for his sons but for himself as well. God began to speak to Jerry and to show him truths in the Scripture that he hadn’t seen before. I’ve enjoyed every season of our lives together, the good and the not so good – and it just keeps getting better! Of all the jobs I’ve ever had, I have to say that my job as husband and dad is the one I love the most. And although I know if I do my ‘dad’ job correctly I’ll work myself out of a job, that truth makes my resolve even stronger to be the best dad I can be. In fact, as our sons are growing older, I’ve found that I’ve already started working on my “exit strategy.” I’ve started transitioning my role from that of ol’ dad – the disciplinarian, the “Ogre,” the “Killjoy” – to one of counselor and mentor, and, hopefully, eventually, if all goes right, friend. 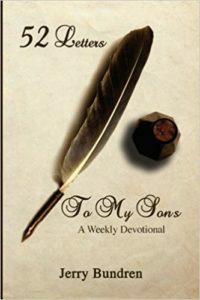 It is for this reason that I decided to write the following letters to my sons, to provide them with some of the insights and wisdom that others, along with the Word of God, have provided me over the years. This book has been very encouraging to me. I hope you will take the time to grab a copy, sit down with a cup of coffee and enjoy!